We visited Marwell Zoo & Paultons Park on adjacent days for Arlo’s birthday, so a hotel that was close by was a must to avoid a drive home between visits and Marwell Hotel was perfectly located and meant that we could check in within minutes of leaving Zoo as the hotel is directly opposite the Zoo entrance. 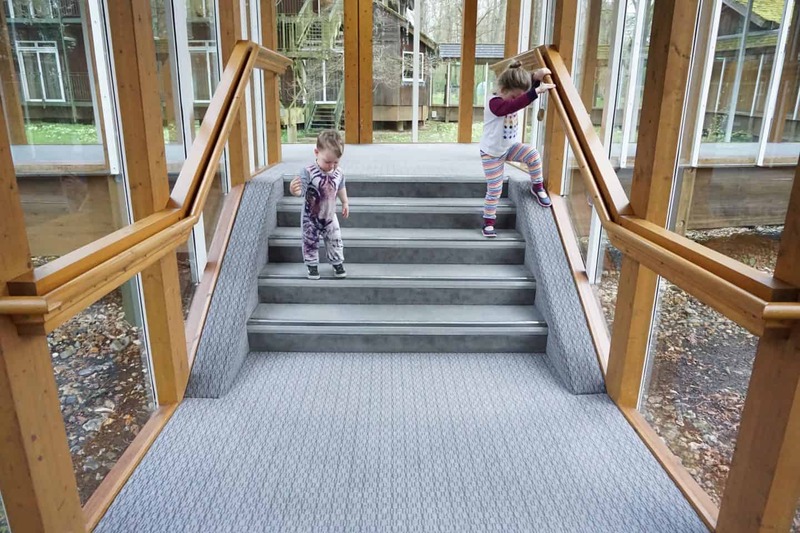 Marwell Hotel is ideal for families, though it also has business facilities like a conference centre too. I guess you would describe it as a themed hotel in keeping with the zoo, but it’s not in your face at all. 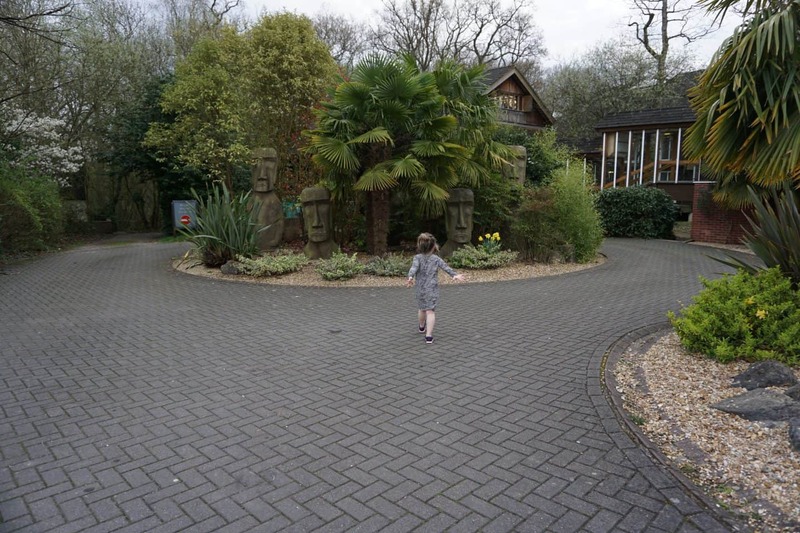 Each of the room blocks are accessed by a central walkway so you can see the gorgeous woodland around (and look out for the elephant!) and the blocks themselves are wooden with external walkways with sliding glass doors so you can see the suroundings from the room, meaning all rooms have a lovely view! There were fantastic black out curtains which kept us asleep longer in the morning than we usually would be at home! The room we had was an executive family room and was so well equipped for a family of four! 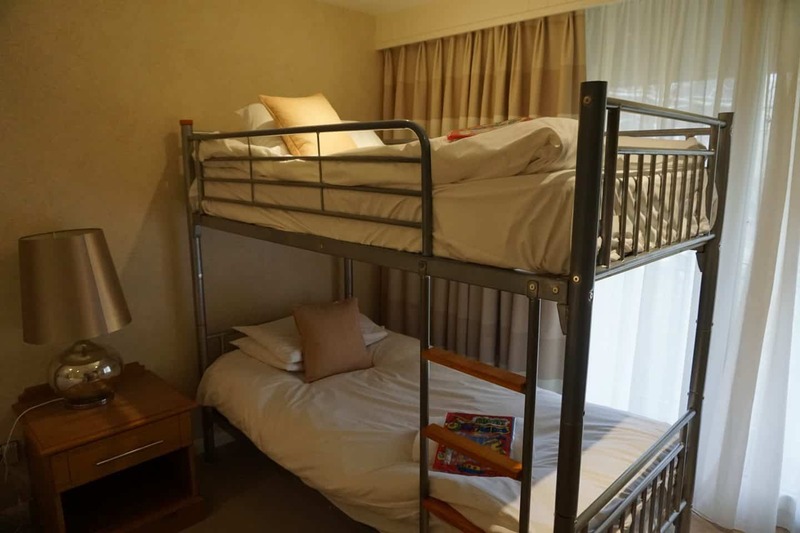 A king sized bed and a set of bunk beds meant there was still plenty of floor space for us to spread out, plus a desk and bedside tables giving plenty of drawer space, plus the wardrobe and a shelf for suitcases. It was a shame we were only staying for one night really as we could easily have space to store enough for all four of us for a long weekend! Our bed was comfortable, as was Athenas although her bottle of water leaked on it during the night (sorry!) and in the morning the sheet and her PJs had stained from the mattress underneath which was a bit grubby and had no waterproof mattress protector on. The only other thing in the room that wasn’t quite up to standard was the net curtain, one of them had a stain on that looked like coffee. The kids both had a great activity pack waiting for them on the bed, so they got colouring when we were unpacking and having a hot chocolate from the tea tray, so both the activity pack and the hot chocolates were a lovely and welcome treat! There were plenty of fluffy cushions and pillows, perfect for a post swim/pre dinner snuggle on the bed, watching one of the hotels selection of Bluray films that we borrowed from reception. There was also a little toy corner in reception, plus an area up a spiral staircase with a computer and game console though we didn’t go up there to use it as our kids are a bit small! The TV in the room was positioned on the wall so that it could be seen from all the beds and it had Sky TV as well as the bluray player, so something to suit everyone’s watching tastes! There was no Air conditioning so our room was pretty hot, being a wooden building but the Dyson airblade fan in the room worked really well to keep the room cool, and you could also leave the sliding doors open a crack though we didn’t in case one of the kids escaped! The bathroom had a great shower head, plus a full sized bath and lovely smelling toiletries, no all in one body wash, a bug bear of mine! There was a huge mirror though the lights in it didn’t work, so it wasn’t good enough light to do my makeup in, but it was light enough to do it at the mirror above the desk thankfully. Talking of lights the bedside lamps were humongous and looked great but weren’t ideal to use as a bedside light for reading if you had other people in the room, an anglepoise style lamp would have been more useful. We visited the pool before dinner, it’s free for all guests to use and you sign in at reception where they give you fresh towels to use. There are separate ladies and gents changing facilities, a gym-room, spa pool, sauna and pool. We were one of about three families in the pool and had plenty of space to splash around. We discovered Athena could doggy paddle across the width of the pool, which is pretty good since she’s not been swimming for almost a year! I didn’t take any pictures of the pool area as there were other guests using it, but there is a bit of go pro footage, and a tour of the room in the video here and at the end of this post. 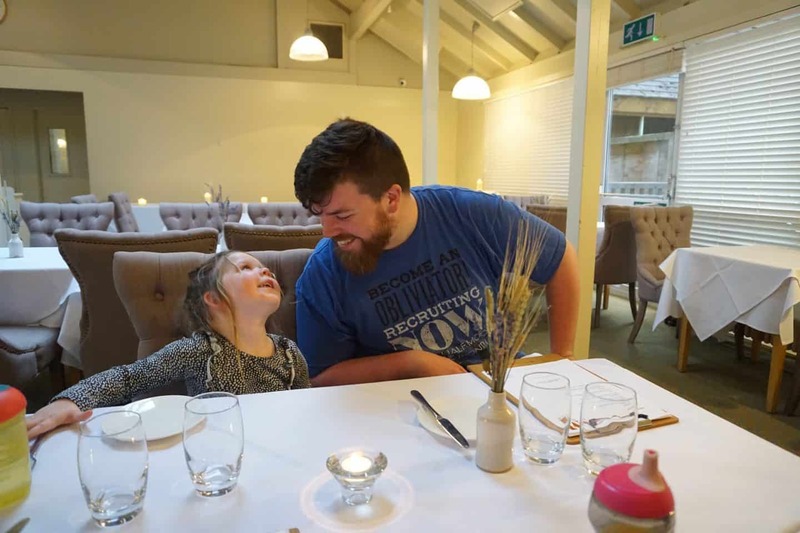 Dinner was so much better than I had expected, we ate in the ‘The Dining Room’ restaurant and it was genuinely one of the best meals I’ve had! In fact Sam and I both said we sort of wished the kids weren’t with us so we could have enjoyed it even more, and had a few glasses of wine to make it even better! I was expecting a standard hotel/gastro pub style menu but it was so much better, each dish had been carefully created and from the descriptions it was so hard to choose what to go for. It also helped that our waitress Emma was so knowledgeable about the menu and genuinely lovely and patient with the kids too, she’s a definite asset to the hotel. 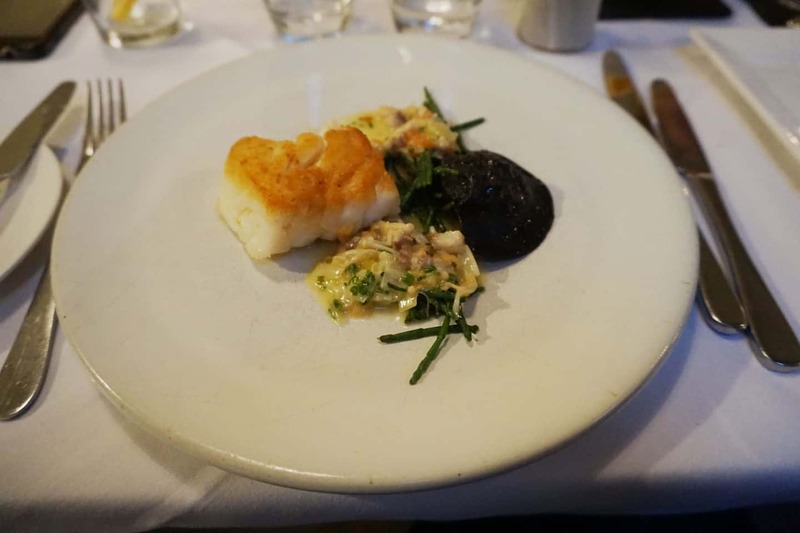 We were served an amuse-bouche before our starter and a palate cleanser before our main course, welcome additions and not just because we were there to review, the other diners got them too! We chose from the main menu although there was a seven course taster menu available too, we just didn’t think the kids would stay awake that long! 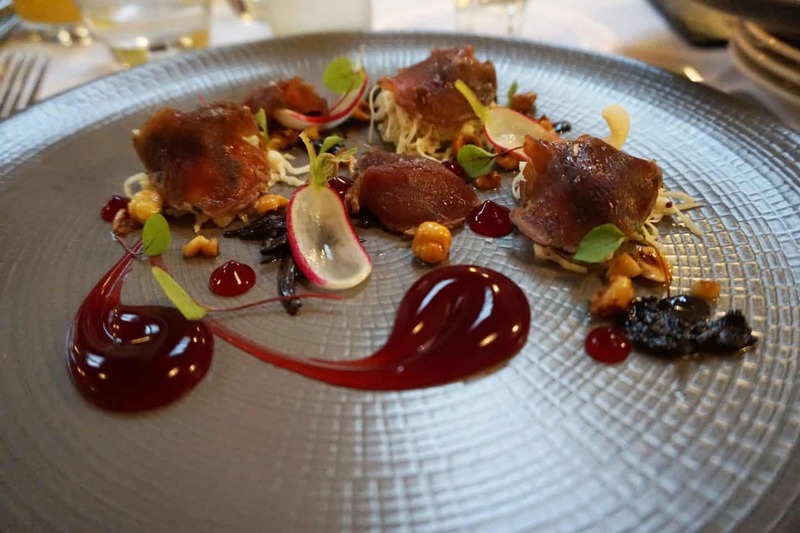 Our starters were Duck Terrine with early grey, malt biscuit & turnip and Sam chose the Venison Carpaccio, with celeriac, blackberry and hazelnut. For our main course Sam had the Roasted Cod with squid ink, leek and fricasse and I chose the Pork Belly, with turnip, broccoli and bacon and we ordered vegetables on the side The flavours just went so well together, with just the right amount of each element of the meal to ensure that all the flavours and textures were equally appreciated. 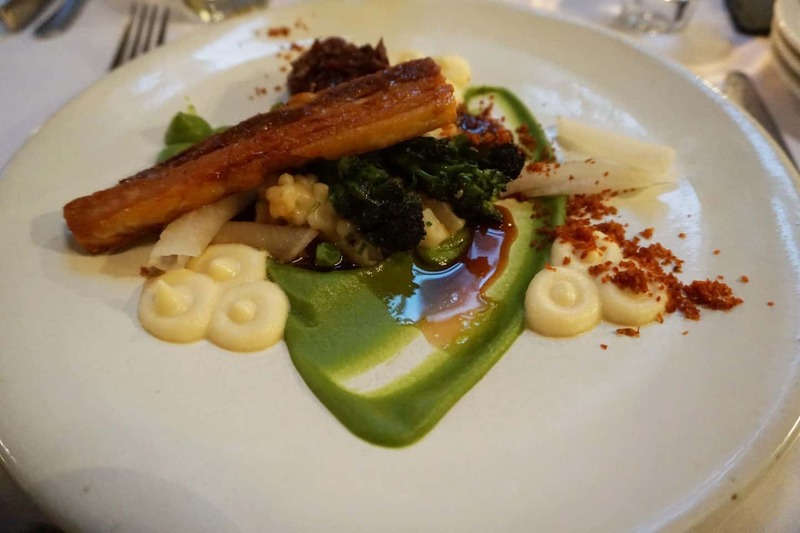 Pork Belly is one of my favourite things to order at a restaurant and this really didn’t disappoint! Sams cod was cooked perfectly and the chunky chips he had on the side was the perfect accompaniment. 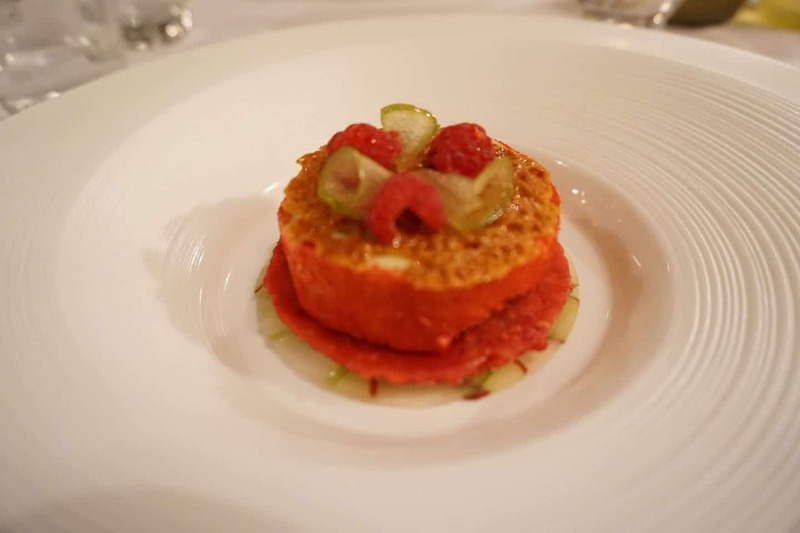 We had the Dark Chocolate Fondant to share, plus a Green Apple Parfait, which still makes my mouth water now when I think of it; crisp tangy apple with honeycomb and rasberry – it was AMAZING. 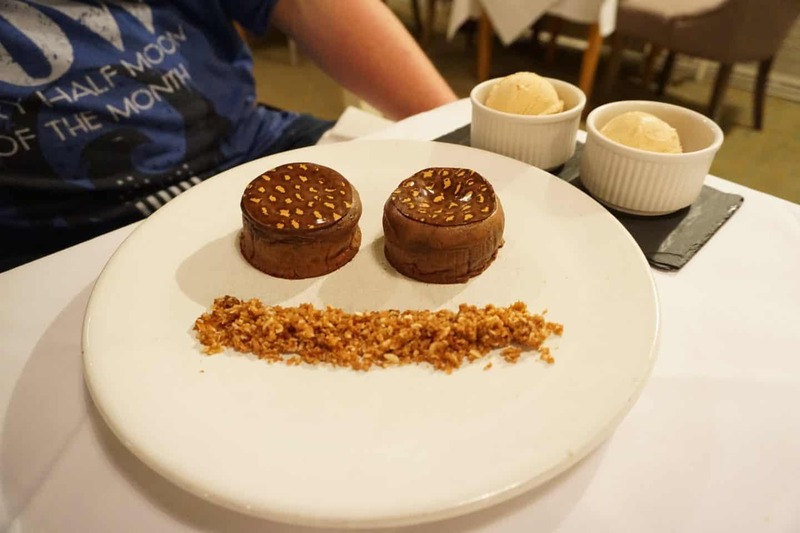 The fondant was also pretty special, two individual puddings with a leopard print top plus malt ice cream and oaty crumbs. The children’s menu was just as delightful as the main menu, we chose local sausages with mash for Arlo and Tagliatelle Pasta for Athena, which both came with a starter and pudding. Everything was still presented perfectly, including their little slices of garlic bread (with cheese at no extra charge!) 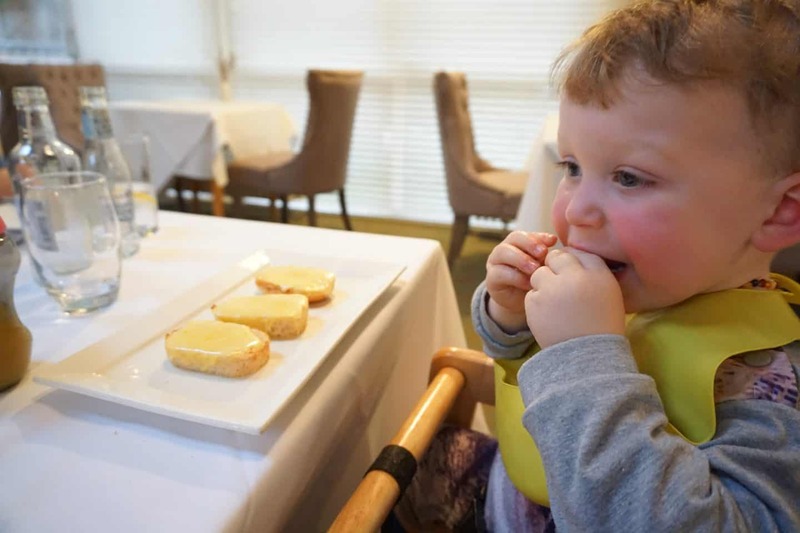 For younger children there is a selection of Ellas Kitchen pouches, also available for free plus a note in the menu that the hotel will sterilise equipment or heat milk upon request,and of course there were highchairs available. After a semi-decent nights sleep (well, once we got to sleep, the kids were so over excited that they didn’t want to sleep till past 10pm!) we woke up at almost 8am which is unheard of for my two, those blackout curtains did their job! A strong, hot shower and a cup of tea and we headed down to breakfast. 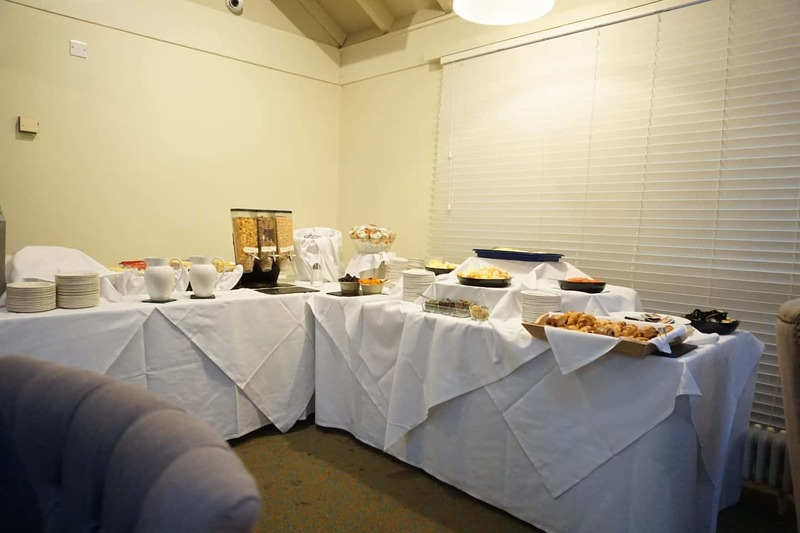 A buffet style breakfast with the option of ordering extras like poached eggs, though we just stuck to the buffet. It was quite busy when we arrived at about half past eight, with a split of business guests and families. A great selection of fruit, pastries, cereals and yogurts plus the cooked food. Self serve breakfasts are ideal when you have kids as there’s no waiting around for food to arrive when you’re ravenous, and you can drip feed them bits and then get your own food from the hot plates and eat it when it’s still warm! We checked out after breakfast, returned the Blu-ray discs we borrowed to reception and headed on our way! You can see the room and some of the pool in the video below starting at 5 minutes in. 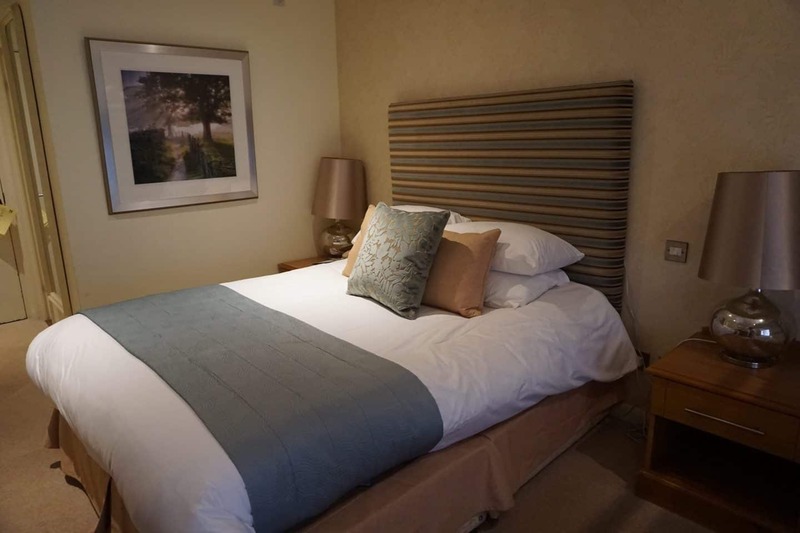 You can book to stay via the Marwell Hotel website, and keep up to date with special offers on their facebook page. 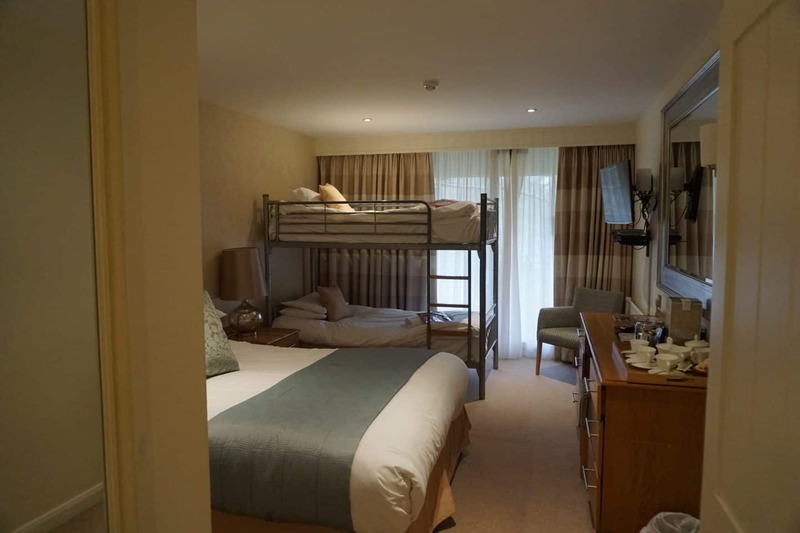 A huge thank you to Marwell Hotel for inviting us to stay in exchange for a review, all words and opinions are my own. Oh wow. This looks lovely! We went to Marwell ages ago and noticed how lovely the hotel looked as well passed. I’m impressed with the food too – good quality and plenty of variety! 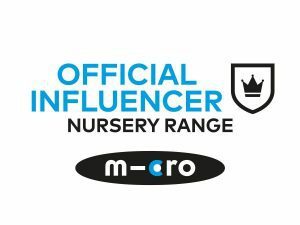 Perfect for families with children of varying ages / tastes / moods! This looks fantastic! What a brilliant day out and the hotel looks great. I’m impressed with the bunk beds. That food looks epic!